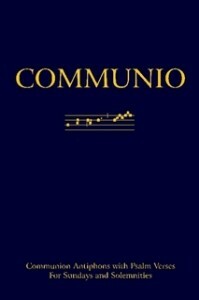 This book presents communion chants for Sundays and Solemnities, in Latin, with authentic Gregorian melodies from the Graduale Romanum, along with fully notated Psalm verses from the Nova Vulgata text. Psalm verses are set to the corresponding tone for each antiphon, as described in the rubrics for singing the Mass. This book includes information for using the antiphons with the current Roman Missal or with the 1962 Missale Romanum. Edited and engraved by Richard Rice, editor of The Parish Book of Chant. Communio is available in softcover and hardcover in the CMAA catalog, and as a free PDF download (see below). 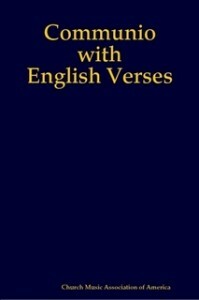 Also, an edition of the book is available with psalm verses in English, to provide an additional option for use at Ordinary Form Masses. The individual antiphons with Latin psalm verses and both versions of the book are available here for downloading.